During their visits to Zimbabwe, Iain, Norma and Jim Storm became aware of the many orphans and very poor children who were unable to attend school for financial reasons. During a visit to Zimbabwe in April of 2011, Jim and Norma gathered information on a number of children who required sponsorship to attend school. Currently 49 orphaned children are attending school assisted by members of Link Church. Sponsorship costs £100 per year or £8.50 per month for each child. 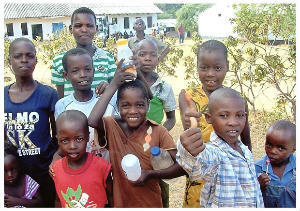 These are the stories of some of the children whose lives are being changed by the sponsorship programme. There is a boy of 14 years of age. His parents are both dead and he and his younger brother stay with his grandmother. He is doing odd jobs to pay his school fees as his grandmother cannot afford to pay for him to go to school. He has health problems but has no money to pay for the medical help he requires. One girl of 13 years of age is in Grade 4 of Primary School. Both her parents have died and she is being cared for by her grandmother. She hasn't been able to attend school consistently due to not having enough money for the uniform, school shoes and books. She often goes short of food. Another girl of 13 years of age is also still in Primary school. Her school attendance has been erratic as she has no one to look after her properly. Both her parents have died and her aunt, who had been caring for her, has also recently passed away. Her uncle is currently her guardian but there are concerns about abuse. She has a brother but his whereabouts are unknown. One young man is 18 years old. His parents died in 2006. He lives by himself in the family home. He attends secondary school and is a good student who would like to go on to college. He has no funding for the next school year and no money for food, books etc. For more information on the Zimbabwe sponsorship programme, please contact the church office.